Scott Pedder held on to his lead to claim the overall victory in the Australian Rally Championship meeting at Coffs Harbour. The Renault Clio driver took a comfortable lead into a final day at Coates Rally Australia, which saw a continuation of his rivalry with Brendan Reeves, who retired from Friday’s opening leg with a camshaft failure. Pedder won two stages on the final day compared to Reeves’ three, which proved to be more than enough to take the overall victory. Title rival Reeves left the event on a high note with the win in Leg 3. Volkswagen driver Mick Patton finished second overall while the Citroen of Adrian Coppin was third. 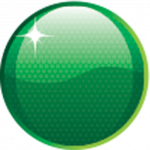 “I knew from the start of the event that the times would be there if we could string it all together, and we finally got there. 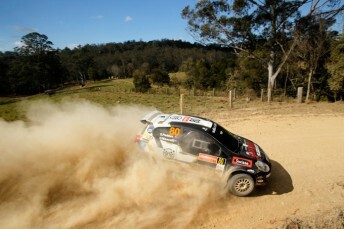 The Australian Rally Championship will be decided at the final round Rally Victoria on November 14-15. 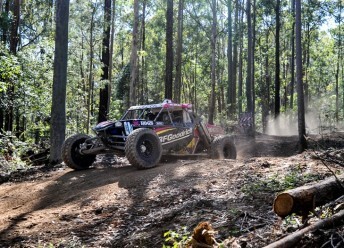 In the Australian Off Road Championship, Shannon and Ian Rentsch retained their championship lead with outright victory in the Coffs Coast 400. The father and son team completed the eight laps of the 50km course around the Lower Bucca State Forrest a full 10 minutes quicker than their nearest rivals. Matthew Martin and daughter Kerrie finished in second while Team Taylor Pro Buggy racers Ryan Taylor and Josh Curran claimed the final spot on the podium.